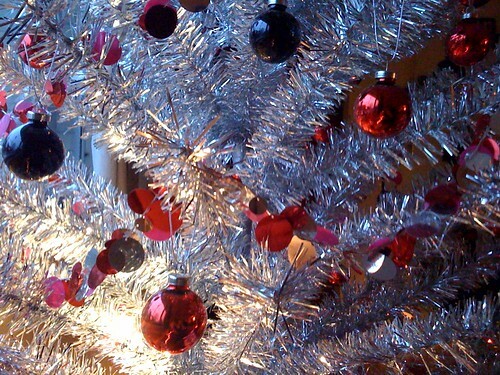 Merry Christmas and happy holidays, dear Reader. This song captures so much of what I feel about Christmas. It talks mostly about family, but I feel that you’re part of my family, so I dedicate it to you. Watch and listen on YouTube if you like. I do not have a large collection of holiday and seasonal decorations. I have some decorations for Christmas, a few for Halloween, and that’s it. Happy Thanksgiving from me and my niece, Rachel. Created in Brushes for the iPad. Some years back, one of my sisters read a book, The Five Love Languages, which boiled down the ways people like to give and receive love into five “languages.” A person tends to be able to perceive love through one of these styles, and to give via one (although not by any means necessarily the same style). Thus: I might like to be told how wonderful/beautiful/amazing I am, but when I want to show someone that I appreciate them I could instead think the right thing to do is to give them a big hug. So here’s the thing: I myself am big on the “spending time together” kind of love, and I’m really NOT into any of the other style. If you can find time to have lunch with me, I understand that you care about me. And if I can wrestle myself out of my hermetic hovel to share a meal or a drink with you, you should know that you are special to me. But so. Telling me that I’m terrific: not much effect. Giving me Tiffany earrings? I’m likely to rattle off a diatribe about blood diamonds. Shovel my snowy sidewalk? That I decidedly will appreciate, but I’ll view it as a debt and make plans to shovel yours in an upcoming blizzard. Give me a hug? I will hug back as best I can, and I will feel really, really awkward in the process. Anyway. The Kinks’ classic holiday song “Father Christmas” always has held a special meaning for me. Yeah, give those gifts to the little rich kids. Give the money to the other kids who need it. But if you want to give me something, c’mon and let’s grab a coffee and chat. * Can we please stop using “gift” as a verb? Where did this usage come from? Every time you “gift” something to someone, a tiny kitteh chokes on holiday ribbons. Oh hey! It must be December. I’ve been scurrying through the last few weeks (months), head down and nose to grindstone, largely oblivious to the seasons. But I can’t help but notice that holiday music is back. Even my own iTunes has started playing it, unprompted by me. The other night I turned on the TV for a small break, and WQED was showing a concert by Straight No Chaser. I recognized the name — I had blogged about their witty a capella version of “Twelve Days of Christmas” in 2007. Apparently the success of that YouTube video and recent interest in glee clubs has brought them fame, fortune, and a nationwide tour. All of which serves to remind me that I am far, far behind schedule in posting my annual Holiday Music Countdown. It’s already Day 2! And I don’t have a theme! As it happens, last year I became so busy in December that I failed to finish my countdown of the 25 kookiest holiday songs. So the obvious solution is to resume that countdown, as if the intervening year had never happened. OK? OK! View from the snowflake truck, originally uploaded by cynthiacloskey. 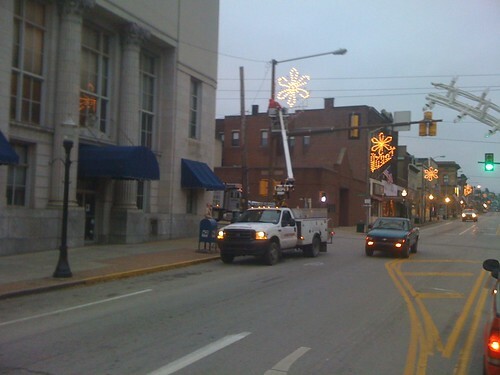 This Sunday morning, at the alarmingly early hour of 6:30am, I and a group of other volunteers for Butler Downtown helped to set up the electric snowflake decorations on Main Street, Butler, PA.
We volunteers unloaded the decorations from the special rigs they’re stored and transported on. In the photo above, we’re riding along on the truck with some extra decorations, back to Butler County Ford where they’re stored. Good heavens, they were quick. 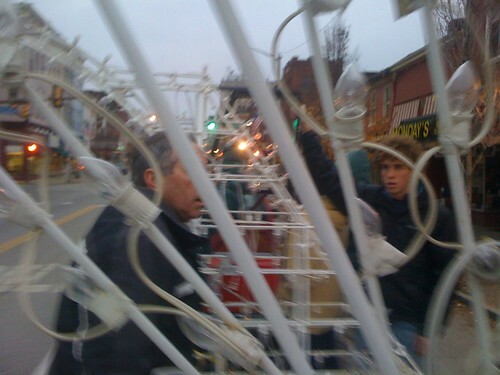 We needed several trips to get the decorations into place, as they were stored on four different rigs and we had just one truck and trailer to transport them. By the time we got the larger snowflakes out on the street, the Armstrong guys had nearly caught up. When we came back with our second batch of the smaller, star decoration for the gas lamps, they were standing waiting, tapping their feet in the cold. The whole thing took under two hours. Afterward, we went for breakfast at Linda’s South Side Restaurant, a classic diner. I had a massive and delicious potato pancake with sausage and some good coffee. I’d love to show you a photo of it, but there was not a chance to take one as I pretty much inhaled the food the moment it hit the table. Decorating Main Street is hungry-making work. Tonight I went back to see the results of our endeavors. 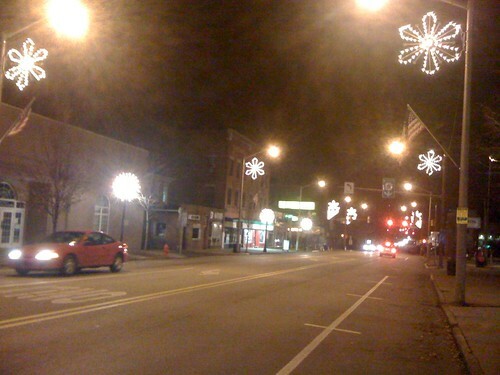 The street looks lovely, festive and bright. My iPhone can’t capture the scene — too hard to balance the strengths of the various light sources. I’ll try again with a better camera. But the shot above gives at least a small taste. So far, each day in December 2008 has been a little stranger than the last. As a result, I’m definitely looking forward to a relatively quiet and peaceful Christmas Eve and Christmas Day. I don’t know that they’ll actually be quiet, but I can hope. I wish you a happy holiday too. Continuing our Kooky Christmas Countdown of strange and wonderful holiday songs. Here’s a heartfelt plea from a practical woman. You want to make me happy this year? Like a five pound box of money. And at the same time I’ll have the change to pay my rent. It’s much better with than without it. You can listen to the song on YouTube. (If you find a video of her singing it, please let me know.) Or find it on Hipsters’ Holiday, one of my favorite holiday compilations. Pearl Bailey was an award-winning Broadway performer, and as best I can tell she’s the only person who’s ever recorded this song. If you’re interested, check out Miss Bailey on the Muppet show, in a particularly surreal clip made up of parodies of songs from musicals, thrown together in a Muppet version of Camelot (although none of the songs comes from the musical Camelot). Either you like this song, or you hate it, or you liked it the first couple of times you heard it and now you hate it, or you liked it and then hated it and now you’re back to liking it again. I fall into that fourth camp. I think it’s the line "A&P has provided me / With the world’s smallest turkey" that does it for me. Not sure if you know the song? Listen to it on Last.fm: "Christmas Wrapping."